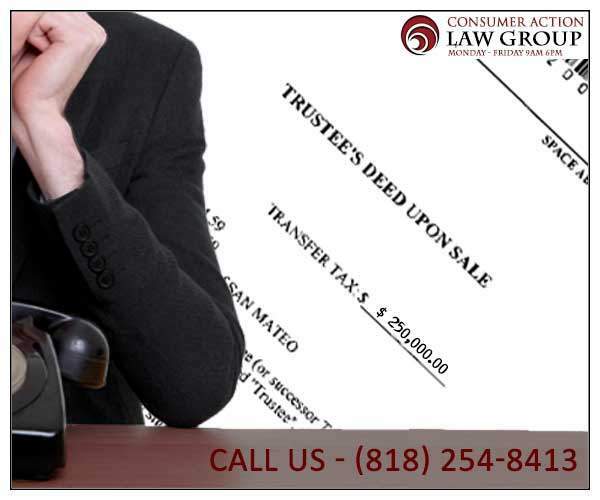 Attorneys at Consumer Action Law group are specialized in stop trustee sale. The experienced foreclosure attorney will evaluate and find a solution to stop foreclosure by taking legal action, while making sure that the lender is not moving forward with the foreclosure. June 30, 2015 – Los Angeles, CA– -In the state of California, the Home Owner Bill of Rights Law, SB900 as it is more commonly known, is in effect to help protect borrowers from illegal foreclosure. This law requires that the lender sends a notification to the borrower, prior to starting the foreclosure process, which offers the borrower financial assistance. If you receive a foreclosure notification like a notice of default or intent to accelerate the loan, it is important that you talk to our foreclosure attorneys as soon as possible. In the state of California, the majority of foreclosures are non-judicial. This means that there is no court order required to start the foreclosure process. The process is carried out by the lender’s agent, also known as the trustee. The laws related to non-judicial foreclosures, particularly those covered by SB900, are very clear and strict. The foreclosure process officially starts with a notice of default notice, which gives the borrower 90 days to catch up with the missed payments and reinstate the loan. Homeowners that have received a notice of default or notice of trustee sale need to talk to a foreclosure lawyer in order to stop a trustee sale from occurring. Dual tracking: If homeowner apply for a loan modification, it is against the law for the lender to continue with the foreclosure while the modification is still being reviewed; prior to any decision. If homeowners approved for a loan modification, the foreclosure will be stopped. Homeowner must have a single point of contact at the lender. This means they should only be dealing with one person at the lender when it comes to foreclosure. Homeowners have to receive written notifications and updates with regard to their foreclosure case. Many lenders will not do this, avoiding any paper trail that could be admissible in a lawsuit. An experienced foreclosure attorney will evaluate and find a solution to stop foreclosure by taking legal action, while making sure that the lender is not moving forward with the foreclosure. A good foreclosure lawyer can record a ‘Lis pendens’ on the property to place any future buyers on notice of pending litigation. A foreclosure attorney needs to work closely with homeowner inorder to determine the best options to move forward. In many cases, bankruptcy, either Chapter 7 or Chapter 13, depending on the nature of your debts, are the best methods to stop foreclosure from moving forward. However, the foreclosure attorney will look closely at the foreclosure case to determine the best possible option. In many cases, you will not have to deal with the lender at all.